The intended use of your rifle dictates bullet choice, and bullet choice dictates the proper AR barrel twist rate. One of the great mysteries about the 5.56 NATO AR is “barrel twist.” This refers to the twist rate of the rifling in the barrel that applies spin to the bullet — spin stabilizes the bullet — and it’s something that many shooters don’t know that much about. Using the correct bullet to match your AR barrel twist rate, or vice versa, is critical for accuracy. Rifling is rated by “twist rate,” which indicates the distance required for one groove to make a complete turn, rotating 360 degrees. A barrel with 1:12 rifling is a slow twist, meaning it takes 12 inches for the groove to make a full rotation. Said another way, a bullet must travel through the barrel 12 inches before it spins one complete rotation. A 1:7 twist is faster — one rotation in 7 inches — and applies more spin to the bullet. You can usually get away with spinning a bullet faster than necessary, but a bullet that’s spinning too slowly isn’t stable and won’t be very accurate. Nearly every AR manufactured today has the barrel’s twist rate stamped into the outside of the barrel. Why are there different twist rates for the AR? Because there’s such a wide variety of bullet weights available. But to fully understand this, we need to look at a little bit of AR history. The new Colt M16A1 Reissue utilizes a slower 1:12 twist rate, much like the older, original M16A1s. After World War II, with a brief interruption for the Korean War, the American military decided that a lightweight rifle shooting a bullet of “intermediate” weight — so troops could carry more ammo — was the key to victory. The original Armalite AR-15, later adopted as the M-16, was designed to be an “assault” rifle, firing a .223-caliber bullet with an effective range out to 300 yards. This would replace larger “battle” rifles that fired a heavier bullet, such as the .308 round, and were accurate for distances out to about 800 yards. As a result, bullets started to get heavier. The XM196, the original tracer round, was heavier than the XM193. But the 1:14 twist rate was too slow to stabilize the heavier bullet, and 1:12 rifling became standard. This rate would be used in military barrels until the A2 version of the M-16 was adopted in the 1980s. With the birth of the NATO round M855, a 62-grain bullet with a “penetrator” core for punching through steel and such, came the need for a faster twist rate. The twist rate was increased from 1:12 to 1:7 inches of travel, or twice the rate used in earlier versions of AR rifles. Commercially available ARs began to show up with a 1:9 twist rate, which provided stability to a wider range of bullet weights. Long-distance shooters began using 1:8 and 1:7 twist rates for bullets weighing 70-80 grains. What twist rate do you need? It depends on what you’re going to do with your AR. 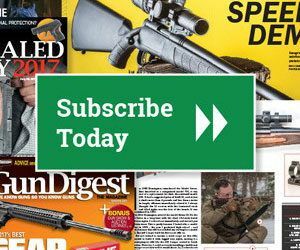 A carbine set up for self-defense is going to differ from a rifle set up for competitive shooting at long distances or varmint shooting. And for self-defense, it would be a very rare situation where you’re justified in shooting a threat at long distance, and at closer distances, over-penetration can occur with heavier bullets. You choose bullets based on the anticipated use of your AR. The bullets you need determine the twist rate of the barrel. Or, the AR you have dictates what ammunition you use. For example, with an older, original AR and a 1:12 barrel, you’re going to be limited to 55-grain bullets and lighter weight varmint rounds, which are usually in the 40-grain plus weight range. This barrel will not provide stability to anything heavier than 55-grain bullets. A heavy bullet without enough twist is unstable. You can shoot them, but you’ll see bullets going through the target sideways, and accuracy is definitely going to suffer. A 1:9 twist, which is found in a lot of commercial ARs, works well with 55- to 68-grain projectiles. If you want to shoot heavier bullets, those up to about 77 grains, you’ll need a 1:8 twist. The 1:7 twist, currently the standard for military weapons, works well with bullets up to 80 grains. This “fast” twist might create problems with extremely lightweight varmint rounds, such as 36-grain bullets, but it will work well with most everything else. Again, you can shoot lighter weight bullets with a faster twist, but as mentioned, shooting heavy bullets in a slow twist will cause problems. As long as you have a fairly “recent” AR and you’re not shooting bullets at the extreme ends of the weight spectrum — in the 30-grain or 80-grain ranges — you’ll probably be safe with the barrel you have. Buy a variety of ammunition with different weight bullets and test-fire them to discover what works best in your AR. If you’re going to build an AR for a specific application, especially when you want to get the maximum accuracy available, you’ll want to match the barrel twist to the bullet you’re going to use. The AR is a fantastic firearm; you can set one up for almost any purpose. The key is knowing what you want it to do, and then researching to find out what you need to fit that application. This is especially true for barrel twist and bullet weight, ensuring you have the right combination to hit your target accurately.